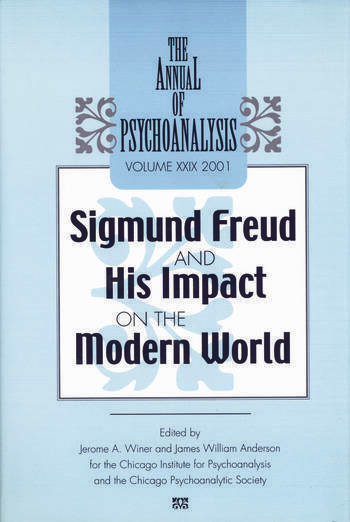 Sigmund Freud and His Impact on the Modern World, volume 29 of The Annual of Psychoanalysis, is a comprehensive reassessment of the influence of Sigmund Freud. Intended as an unofficial companion volume to the Library of Congress's exhibit, "Sigmund Freud: Conflict and Culture," it ponders Freud's influence in the context of contemporary scientific, psychotherapeutic, and academic landscapes. Beginning with James Anderson's biographical remarks, which are geared specifically to the objects on display in the Library of Congress exhibit, and Roy Grinker Jr.'s more personal view of Freud, the volume branches out in various directions in an effort to comprehend the multidimensional and multidisciplinary richness of Freud's contribution. In section II, we find authoritative summaries of Freud's scientific contributions, of his continuing impact as a thinker, of his notion of symbolization in the context of recent neuroscientific findings, and of his status as a "cultural subversive". In section III, contributors hone in on more specific aspects of Freud's legacy, such as an experimental method to review how Freud's idea of childhood sexuality has fared and a look at the women who became analysts in the United States. In the concluding section of the volume, contributors turn to Freud's influence in various humanistic disciplines: literature, drama, religious studies, the human sciences, the visual arts, and cinema. With this scholarly yet highly accessible compilation, the Chicago Institute provides another service to its own community and to the wider reading public. Sure to enhance the experience of all those attending "Sigmund Freud: Conflict and Culture," Sigmund Freud and His Impact on the Modern World will appeal to anyone desirous of an up-to-date overview of the man whose work shaped the psychological sensibility of the century just past and promises to reverberate throughout the century just born. "My Father's Analysis with Sigmund Freud" - Roy R. Grinker, Jr.